The Nationals appeared to have left their collective team heart elsewhere Monday night when playing the Houston Astros in Washington. It’s painfully obvious at this point in September that whatever underdog grit this team had after going 20-15 to start the season is long gone. 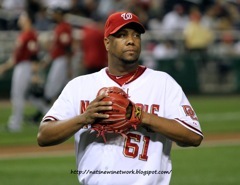 Livan Hernandez looked sharp on the mound retiring all six of the first batters he faced, but that two inning no-hitter took a turn for the worst with some deplorable defensive plays in the fifth. The worst of it all is that the Nationals scored two runs in the top of the first. They were winning to start things off but couldn’t hold on for dear life. ﻿In the fifth, the Astros bats let lose while Hernandez and Adam Dunn combined for a misplay at first base which allowed Astros third baseman Chris Johnson to score. But that wasn’t all, the Astros just kept scoring – including a three-run blast off the bat of Geoff Blum. When the fifth inning was all said and done, the Nationals had lost their lead, committed three errors, and were down 8-2. The Astros didn’t score again for the rest of the night thanks to four scoreless innings from Craig Stammen, Collin Balester, and Joe Bisenius, but the tone of the game couldn’t be erased. The thinnest crowd in Nationals franchise history scattered themselves about Nationals Park – all 10,999 of them. Danny Espinosa and Ryan Zimmerman had a couple highlights between them in the sixth with some stunning defensive stops around the horn. Espinosa did his best Willie Mays impression robbing Humberto Quintero of a single with a jaw-dropping over-the-shoulder catch. Zimmerman followed the rookie’s performance with a backhand sliding stop and overhand throw to first to remind even the saddest Nats fan that there is still something to smile about. Other We Love DC Sports writers contributed to this report.